Meagan Morgan, MS CCC-SLP, a Speech Language Pathologist, provided our staff with an excellent training in helping children communicate. She gave me permission to make this available to parents who may enjoy reading her information and learning more about helping all children communicate well. Sugar Plus Acid Equals Double Trouble. Almost everyone knows that the sugar in soda pop is bad for your teeth, but it is not commonly known that the acid content in both diet and non-diet pop compounds the trouble for your teeth. The acids directly attack tooth enamel leading to cavities. Soda Pop And The Acid Connection. The following chart profiles both acid and sugar. As you can see, pure water, at 7.00 (neutral) is the idea. Battery acid at 1.00 is an example of a liquid that is extremely acidic. 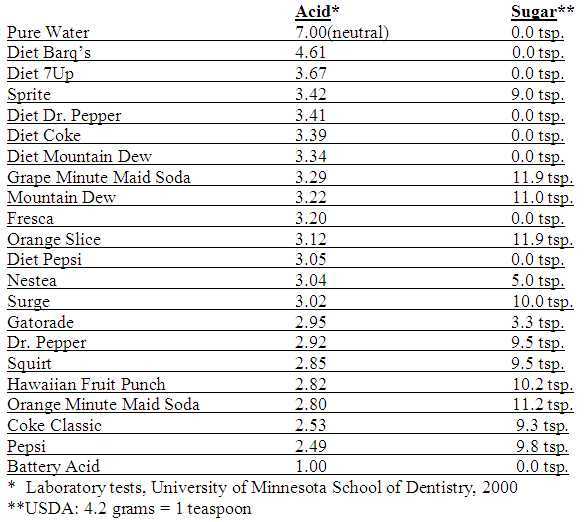 Soda pop profiles between 4.61 and 2.49 which is closer on the scale to battery acid than to water.